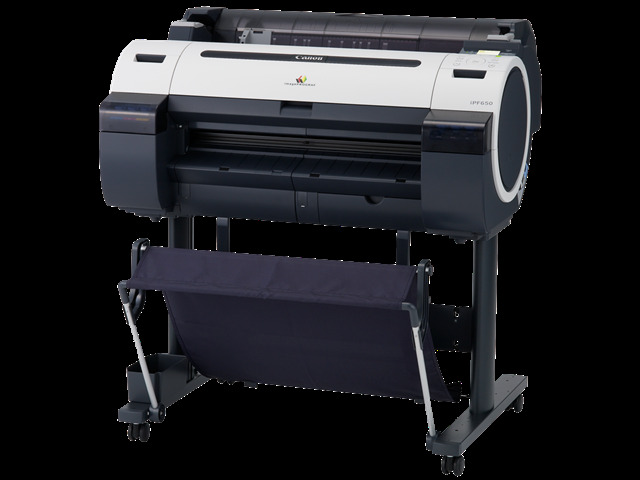 The Canon imagePROGRAF iPF650 is a wide-format image printer designed for personal and small workgroup users who need to produce wide-format documents. It includes a number of features not necessarily seen on other printers like it, but for the most part is quite standard. The printer measures 41.8" by 39.3" by 34.3" and weighs approximately 119 lbs, requiring its own stand or that it be placed upon a credenza, as it otherwise won't fit alongside other equipment and isn't tall enough to stand free and be easily accessed. The imagePROGRAF iPF650 produces documents at a maximum resolution of 2400 by 1200 dpi with an ink droplet size of 4 picoliters. It has a nozzle pitch of 1200 dpi and a total of 15360 nozzles: matte black has 5120 and there are 2560 each for cyan, magenta, yellow, and black. The printer supports media as long as 59 feet through its roll feed and 63 inches for cut sheets. The maximum media roll diameter is 5.9 inches. The printer can print to borderless documents as large as 10 inches, 14 inches, 17 inches, 24 inches, B2, or A1, and can feed paper through either its top or front loader. The printer has a minimum custom media size of 10 inches by 8 inches and a maximum size of 24 inches by 59 feet, making it clear that the printer can process extremely large jobs. The printer is made to print to Self-adhesive synthetic paper, Heavy-weight glossy photo paper, Glossy photo paper, Heavy-weight semiglossy paper, Heavy-weight coated paper, Coated paper, Proofing paper, Translucent film, Tracing paper, Synthetic paper, Matte paper, Semi-gloss photo paper, Glossy paper, Plain paper, High resolution paper, and Matte photo paper. The printer includes a Print Job Accounting function, which allows you to keep track of individual user ink and media costs, as well as the amount of pages printed, to better analyze print costs and potential downtime. An Economy Print Mode can be enabled, which reduces the amount of ink necessary to produce drafts and test prints. The printer has a self-propelled dual rotary cutter, as well as a sub-ink tank system that allows ink to be replaced during jobs without stopping the print job or a minute of downtime. A status LCD is built into the printer in order to reduce the amount of time one must spend at a computer to check status and to perform maintenance. The printer includes 256 MB of buffer RAM which cannot be expanded, more than offered by most inkjet printers but logical given the size and density of jobs likely sent to this printer. 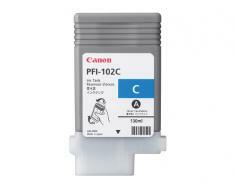 For connectivity, it includes a USB 2.0 port and a 10/100/1000 Base-T/TX Gigabit Ethernet port, which is rarely offered standard on printing equipment but could prove extremely useful in situations where the other systems are wired to support it. Supported operating systems include Microsoft Windows 2000, Server 2003, Windows XP, Vista, Server 2008, and Mac OS X. The printer includes support for HP RTL, GARO, and HP GL/2 print languages. The printer consumes 140W of power at its maximum and 5W of power or less when in standby. The iPF650 doesn't include any additional features available on multifunction high definition inkjets or multifunction office printers, meaning that office environments will likely need another device for faxing, scanning, and printing non-high-resolution images. Review it: "Canon imagePROGRAF iPF650 "
Consumables for the iPF650 consist of ink tanks for matte black, magenta, black, cyan, and yellow ink, all of which are measured at 130 ml. Over time the print head and the maintenace cartridge will also require replacement so as to prevent ink from clogging and waste ink overflow. Whereas text and consumer photo printers are rated on a per-page basis, high-end photo printers measure their output solely in milliliters of ink per cartridge, as consumption and the amount of sheets produced varies drastically based on how often prints are made, at what resolution, and how what colors make up the print.